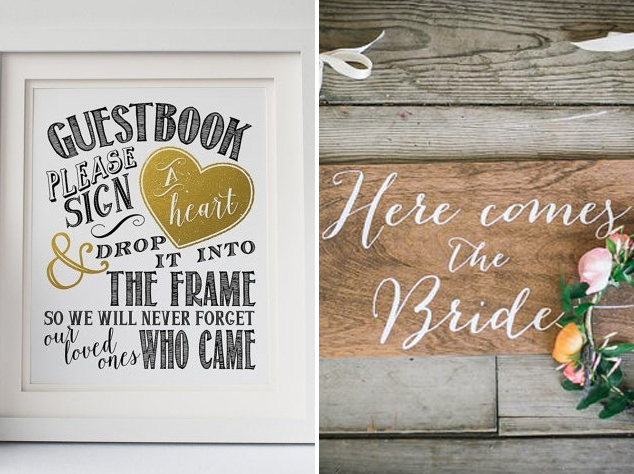 I wanted to add some rustic touches to the wedding so I searched Etsy to find decorations. I love Etsy and I love everything I purchased. The items made the wedding even more unique. Some more details on the items I bought, and the etsy shops I purchased them from, are below. 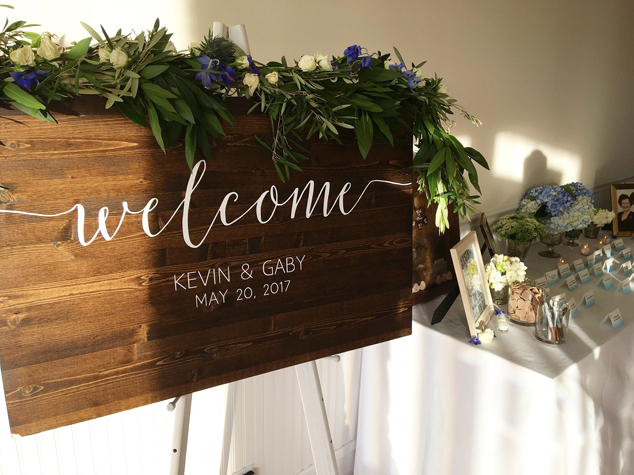 OAKYdesigns: We purchased our wedding sign from OAKYdesigns. Our coordinator placed it at the entrance of the venue- it was a beautiful thing for our guests to see right as they walked in. I plan on getting hooks installed on the back of the sign so we can hang it in our home. It'll be a nice reminder of an incredible weekend. 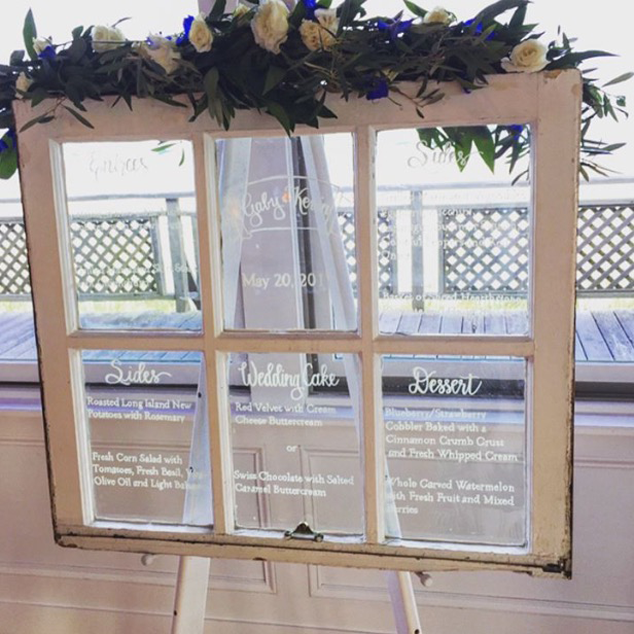 OAKYdesigns: We also purchased our table numbers from OAKYdesigns. 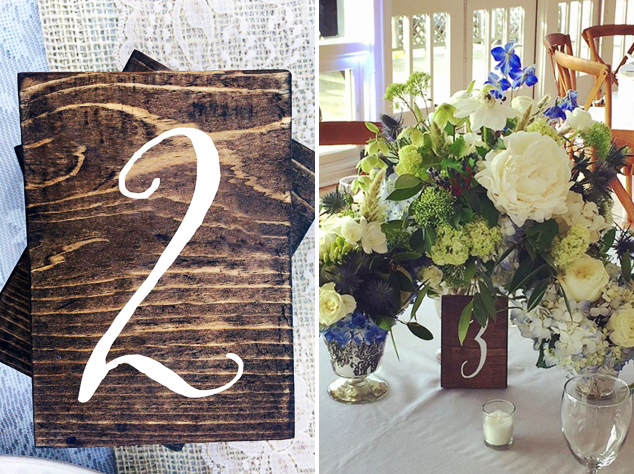 The wooden numbers went perfectly with the floral arrangements. BellaRemiDesigns: This frame was the COOLEST. Instead of a guest book we purchased the frame and wooden hearts. 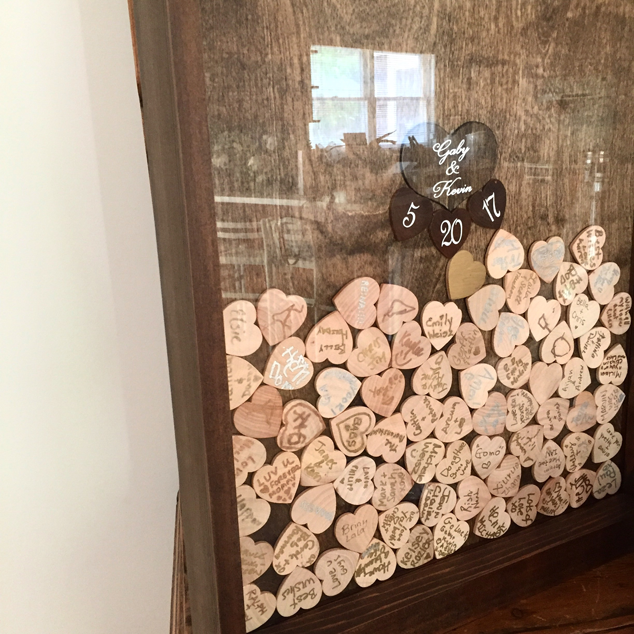 Guests signed the hearts and put them in the frame through an opening at the top of the wood. This is another item I'll be hanging in our home. It will remind us of all the friends and family who surrounded us on our wedding day. Doodidoodles: While our "guest book" was amazing and unique we needed a poster that described to our guests what they should do with the wooden hearts. The print was insanely cheap- I was sent a pdf via email and printed it out myself. To finish it off I purchased a wooden frame from Target to prop up the sign next to the frame with the hearts. PaperandPineCo: My nephew held this sign as he walked down the aisle. It let our guests know that the processional had ended and I was up next! Plus he looked adorable holding it. 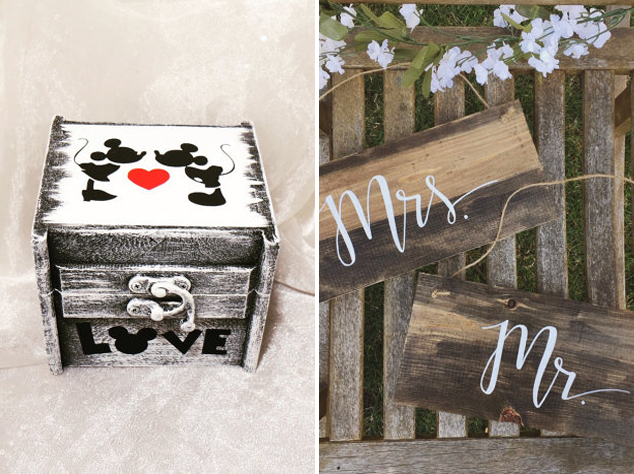 CraftyWitchesDecor: A mickey and minnie ring box? Need I say more? 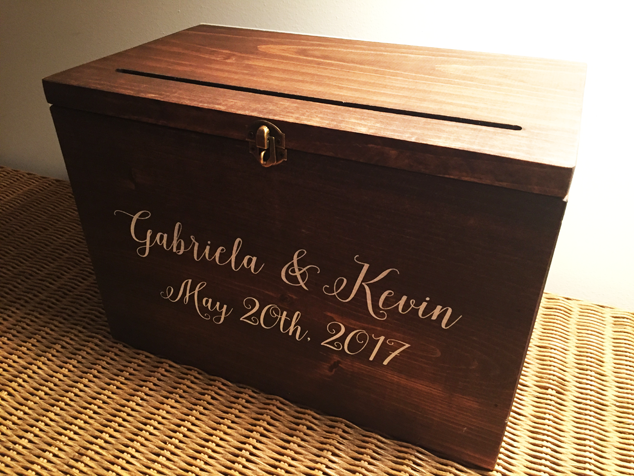 Oh, and an additional reason to love this box- when you open the lid it has our wedding date stenciled at the top. DarlingAdorned: Mr. and Mrs. signs that hung from our chairs at the reception. Everyone knew exactly where we were sitting! OldCityCo: There's something very romantic about an antique windowpane. We used this sign to display our buffet menu instead of printing paper menus. SweetNCollective: Guests dropped off cards in this lockbox. It's a nice size and will be great for storage of knick-knacks (paper menus perhaps) in the future. I love that some of these items are personalized. They'll be a constant reminder of an amazing weekend. I love everything about your wedding, it looked so beautiful! Congratulations! @Sharon, thank you so much for the kind words! !